No one told me about the moving buildings. The first time I visited Savannah, I was at a downtown park where George Washington had made a post-Revolutionary War speech. Suddenly I noticed what appeared to be a colorful building moving behind the brickwork and wrought iron of Factor’s Walk. I followed the unusual site until I came to on opening between the brown and red buildings. That’s when I realize the “moving building” was actually shipping containers stacked several stories high and being ferried down the Savannah River. While freight ships pulling their towering cargo into the Port of Savannah (busiest on the East Coast) are a frequent sight, the illusion of moving yellow and orange buildings continues to surprise me when I see it. That’s the special thing about Savannah: I’ve been there many times over the last 25 years, and there’s always something there to surprise me. Last time, it was Leopold’s Ice Cream, which started business in 1919. Unless you have a local showing you around (as I did), the casual visitor is unlikely to come across this unique destination. Leopold’s claims to have created Tutti Fruitti ice cream. If that sounds too sweet, check out a Guinness float made from – yes, Guinness ice cream. 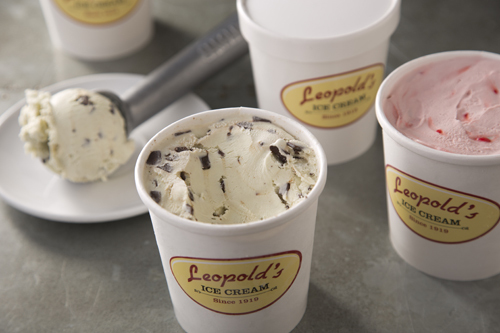 Leopold’s looks like a traditional small-town ice cream shop, but with a twist. One of the three family members who owns Leopold’s is also a movie producer for such films as “Mission Impossible 3,” so film lovers will love the cinema posters. Another great destination for both atmosphere and food is The Pirate’s House Restaurant. Originally opened in 1753 as an inn for sailors, it quickly became a meeting place for pirates and scalawags who made port in Savannah. The inn was even mentioned in the Robert Louis Stevenson classic, “Treasure Island.” Today it’s a large rambling restaurant with 15 dining rooms, a gift shop, and its own resident ghost. Another “haunted” destination is the Olde Pink House Restaurant and Tavern is located in the only 18th Century mansion remaining in the city. It is located in a Georgian mansion built in 1771 of pink stucco that gives the restaurant its name. The Old Pink House is located next to the antique-filled Planters’ Inn B&B on Reynold’s Square. 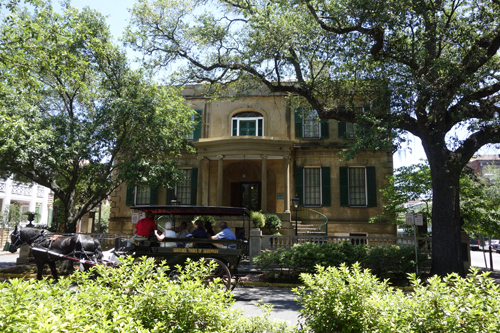 Savannah is famous for its network of some two dozen public squares in the historic district. Each has its own claim to fame, but perhaps the most unique is Rousakis Plaza. Stand on the “X” in the center, speak, and experience an unusual “echo chamber” effect that can only be heard that those within the square. The city is also dotted with boutique shops along River Street, Factor’s Walk and Broughton (where you can browse with drink in hand). City Market offers bistros, galleries, and live music in the evenings. Paris Market offers curios of all types. For antiques, the Noble Hardee Mansion offers hard-to-find treasures. Locals favor the Downtown Design District, with such shops as French Knot, Custard Boutique, and One Fish Two Fish. If you want to see the famous “Bird Girl” statue from the cover of the book “Midnight in the Garden of Good and Evil,” she no longer resides at Bonaventure Cemetery. In 2014, the statue was added to the Telfair Museums collection to protect her from possible vandalism. There’s so much more to do in Savannah it’s almost impossible to list it all. Take afternoon tea at The Tea Room. Taste the honey at Savannah Bee Company. Buy student artwork at the Savannah College of Art and Design (SCAD), one of the top creative schools in North America. Visit Jen’s & Friends for a Moon Pie Martini. 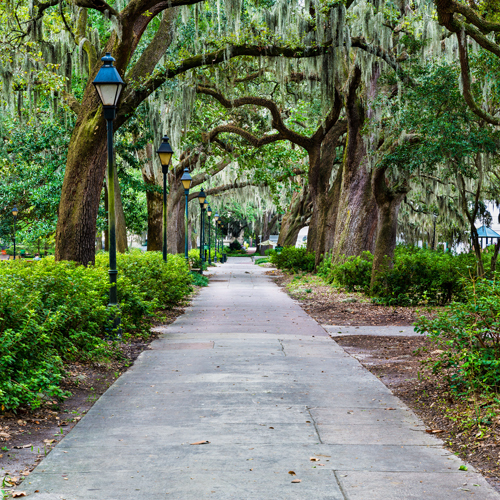 Stroll down Jones Street, voted among the most beautiful streets by “Southern Living” magazine. 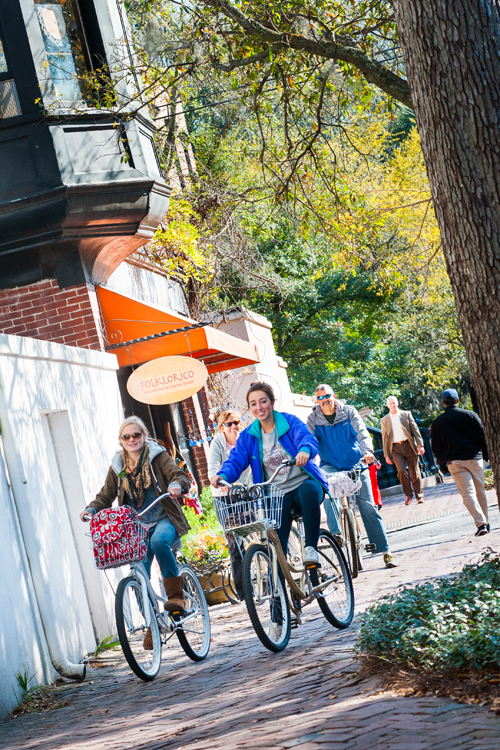 Take a pedicab ride on the cobblestones of River Street. Segway through a historic cemetery. Or drive beneath the spreading canopy of Spanish moss that drapes the live oaks approaching the Wormsloe Historic Site. Take a haunted tour in an old hearse, or go scuba diving with whales off Sapelo Island. The more you see, the more you’ll want to see. Savannah is beautiful, charming, friendly – and never boring.